360 Vision is always working hard at keeping you ahead of your competition, that's why we have added this powerful marketing tool. In just one click, your virtual tour can be submitted to popular social bookmarking and networking sites such as: Digg, Delicious, Furl, Facebook, FriendFeed, MySpace, BackFlip, LinkedIn, Reddit, Twitter, StumbleUpon, Technorati, Mixx and Bebo. Now you, your customers, and their friends can bookmark your virtual tours on these sites!! Start social bookmarking your tours today by clicking on the "Share Tour" tab on any of your virtual tours. It’s no secret that social networking is quickly becoming the norm in internet marketing. That is why our interactive 360° virtual tours have social networking built right into the virtual tour viewer. 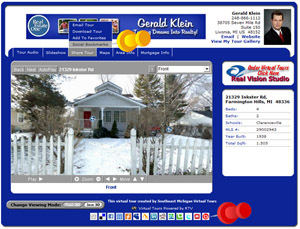 With a click of the mouse, viewers can add your virtual tour to their social networks. Imagine your virtual tour becoming a viral marketing tool virtually overnight. 360 Vision has unleashed yet another powerful property marketing tool that helps you stay competitive in an aggressive real estate market. Just click Share Tour and then Click Social Bookmarks. Now just Click on the icon at the bottom of the screen on the web sites that you already have an account with, enter your login and password and the virtual tour will be added to that site.